In many cases, finding some information using a search engine is an iterative process: you type a query, study the results and then you adjust your keywords. Sometimes your query is too ambiguous and you need to clarify its meaning by adding or subtracting keywords. Xippee is a plug-in that makes it easy to refine your query using words from the search results pages. Let's say that you want to find some news about the Chrome game and you search for [Chrome]. Most of the results are related to Google's recently-released browser, so you can just select "Google", click on the "-" button and you'll get the results for [Chrome -Google]. 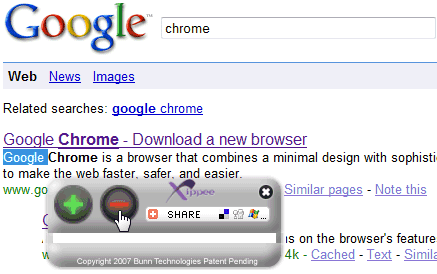 Xippee works in Internet Explorer 7, Firefox, Opera, Safari and you can use it in Google, Yahoo and Live Search. You could also use IE7Pro add-on (only for IE, granted) that lets you select any text on a page and then search for it. Most browsers have an option in the context menu to search for the selected text. This add-on has a different purpose: it lets you change a search using words from Google's snippets. Maybe you want to find something about pythons, so you search for [python]. Most of the results are about a programming language named Python. Instead of adding [-programming] to your query, you can select "programming" from a snippet and click on "-". The same way you can exclude ["Monty Python"], [code] or include [snake]. With search suggest both from Google and Yahoo, this is pretty redundant. I have downloaded Mozilla Firefox and have an old version of IE on my computer which has Windows XP OS. However when I try to download Chrome it says my OS does not allow for download. How can I download Chrome, which I wish to make my default browser?